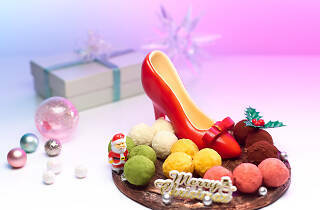 Check in for a Christmas ($68-$98/adult, $34-$49/child) or New Year's ($68-$98/adult, $34-$49/child) feast at Cafe Mosaic at the Carlton Hotel Singapore. Besides a wide selection of fresh seafood on ice, grab servings of crab bisque and butternut squash with roasted chestnuts, lamb rack with garlic and cilantro jus, braised beef cheek, cumin chicken with brandy sauce, and beef stroganoff. A live carving station also dishes out slices of roast prime rib, honey-baked ham, turkey with chesnut stuffing, and roasted OP beef with mild herb sauce. The dessert-inclined will appreciate the hotel's sweet creations this year. 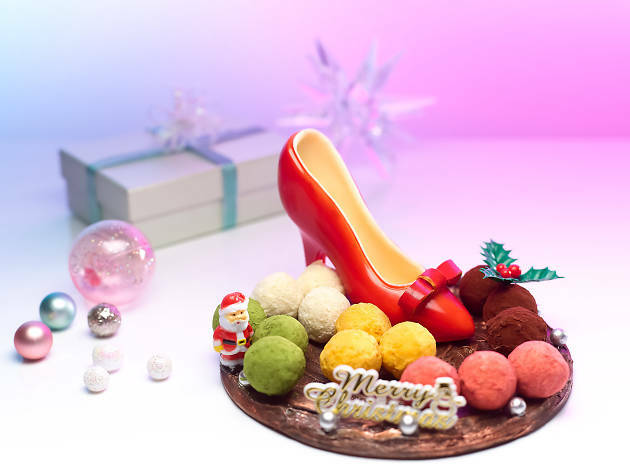 The showpiece is a white chocolate shaped like a stiletto ($38) and served with pralines in flavours of matcha, champagne, raspberry, chocolate and citrus. Flame Valentino log cake ($58/1kg) takes its inspiration from red velvet, and chocolate is accented with red berries, orange Cointreau brûlée and strawberry almond paste in the Chocolate Kumquat log cake ($58/1kg).